For a look at the Kennedy White House from the First Lady’s point of view, we go to 2016’s Jackie. 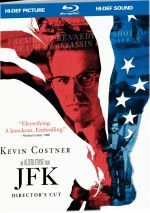 We first encounter Jacqueline Kennedy (Natalie Portman) only days after the assassination of President John F. Kennedy (Caspar Phillipson), as she meets with a journalist (Billy Crudup) to review events. In this circumstance, the film flashes back to aspects of Jackie’s time in the White House, though it emphasizes then-recent events. This means the story mainly looks at the days immediately after the president’s death. Going into Jackie, I expected a broader biography, one that emphasized her time as First Lady but one that gave us a general look at her life. Obviously Jackie comes with a tighter focus, as it devotes the vast majority of its running time to the handful of days that follow 11/22/63. That’s am intriguing choice but not one that I think totally succeeds. In this case, the scope of Jackie seems too concentrated, especially given the events on display. While the view of Jackie in the face of tragedy creates some provocative moments, I don’t know if we get a great feel for the person at the heart of the story. If a movie covered the most tragic few days of any of our lives, would that really tell much about us? I don’t think so, and this means Jackie lacks great insight. Instead, it substitutes voyeuristic tendencies. We follow Jackie through the haze of the post-assassination days and see her largely alternate between confusion and steely resolve. Because I take interest in the history of JFK’s death, I already knew a fair amount about the pressures placed on Jackie and how she acted. I realized she displayed remarkable strength in the face of unspeakable tragedy, and Jackie conveys that pretty well. It just doesn’t go much beyond that to get to the heart of the lead character. The film doesn’t earn much of a connection to Jackie or anyone else, as it remains oddly superficial most of the time. Because of this, the movie comes with a surprising absence of emotional power. Even though I wasn’t alive in 1963, I understand the impact of those events and can be moved by them, as was the case when I encountered the tasteful and impressive presentation at the JFK Library in Boston. Jackie fails to provide much emotional resonance, and it makes an unfortunate choice to graphically depict the assassination itself. Perhaps the filmmakers think the sight of this gore will allow us to understand Jackie’s perspective better – it doesn’t. Instead, the decision to make JFK’s death explicit backfires. It becomes a major distraction that does nothing to get us closer to the character, and it feels like an unfortunate gimmick. Portman earned an Oscar nomination for her work, and I think she probably deserved it, mainly because she manages to breathe life into a role that lacks much dimensionality on the printed page. As best she can, she turns Jackie into a real person. But she can’t overcome the limitations of the source. Jackie presents a semi-voyeuristic look at the grieving First Lady but it fails to dig deep into its subject matter. Jackie appears in an aspect ratio of approximately 1.66:1 on this Blu-ray Disc. Shot Super 16mm, Jackie looked fine for that format but nonetheless suffered from the stock’s limitations. Most of the concerns stemmed from iffy definition. Close-ups looked good, and most wider exteriors showed decent detail. However, these elements lacked great delineation and could veer toward the mushy side. I noticed no issues with jagged edges or shimmering, and edge haloes failed to manifest themselves. I also saw no signs of print flaws. In terms of colors, Jackie went with a fairly teal palette that threw out splashes of pink as well. The tones tended to seem a bit flat, again due to the nature of the source film. Blacks were reasonably deep and dense, while shadows were acceptable; they could be a little murky, but that wasn’t a serious issue. Objectively, this wasn’t a great image, but given the restrictions of the source, I thought it deserved a “B-”. Due to its status as a low-key character piece, the DTS-HD MA 5.1 soundtrack of Jackie didn’t get many opportunities to shine. Nonetheless, it offered a perfectly acceptable soundscape that occasionally delivered more dynamic material. Music filled out the spectrum well, and the general sense of environment worked well. Occasionally the soundfield came more actively to life – mainly elements connected to the assassination– and those moments opened up the mix in a compelling manner. Much of the movie remained low-key, but the track suited the material. Audio quality was satisfactory. Music fared best, as the score appeared vibrant and full. Effects usually stayed subdued, but they always came across as accurate and showed good punch when necessary. Speech sounded crisp and distinctive. Nothing here really impressed, but the soundtrack was worth a “B-”. From Jackie to Camelot runs 22 minutes, 25 seconds. The program offers info from director Pablo Larrain, producers Ari Handel, Mickey Liddell, Scott Franklin, Juan De Dios Larrain and Darren Aronofsky, screenwriter Noah Oppenheim, editor Sebastian Sepulveda, production designer Jean Rabasse, composer Mica Levi, and actors Natalie Portman, Billy Crudup and Peter Sarsgaard. “Camelot” looks at the project’s path to the screen, story and characters, cast and performances, the director’s approach to the material, camerawork and editing, and music. A few decent details emerge, but most of the piece concentrates on praise and happy talk. A Gallery presents 31 images. It mixes shots from the set and movie stills. Nothing great appears but it becomes a decent collection. The disc opens with ads for Hidden Figures and Miss Sloane. We also get the trailer for Jackie. 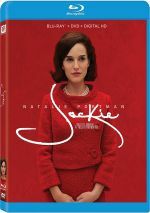 A second disc presents a DVD copy of Jackie. It features the same extras as the Blu-ray. Even with strong acting, Jackie fails to make a strong impression. The movie lacks the depth or introspection it needs to become really meaningful. The Blu-ray presents acceptable picture and audio along with a mediocre featurette. Jackie turns into a moderate disappointment.